For our sixth city in Pat Sloan's Free 2014 Mystery BOM, Globetrotting, we travel to St Lois. 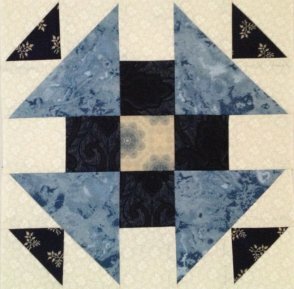 When looking at the block and the fabric chart fabrics 1 , 3, 7, 8, 10 were used. 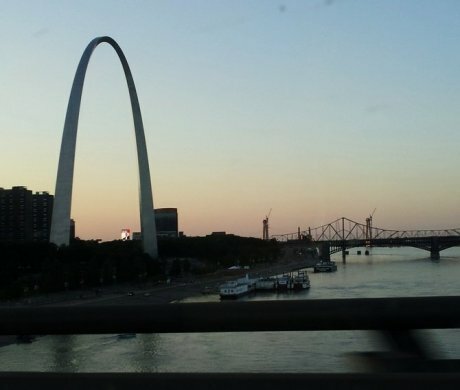 A few years ago on the way to an event Pat and her husband went through St. Louis at dusk.. it was so fun to see the Arch again! St. Louis is a special city for Pat! She got engaged there, they bought their first home and she made many awesome memories. 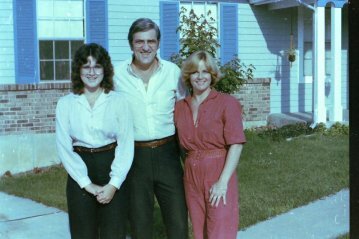 Pat worked with some incredible people who taught her about owning your own business, making beer, building ultralights in your living room, the space shuttle launch, gardening, and cooking! One of Pat's best memories is... Her dad and step mom came to visit Pat and her husband in their new home, her parents lived in Belgium so it was a big trip! How do you like the outfits? It seems dad and I wore the same thing to work.. what?? And my GLASSES and Karen's jump suit? A fun trip down memory lane!